In this article I will show how to configure Pfsense Firewall and Suricata IDS with Kibana dashboard. The explained architecture will provide a modern and functional IDS with a good graphical user interface without spending money in commercial products. The solution permit to monitor in real time attack attempts to network services and to activate, if necessary, the relative incident process management. The GUI gives the possibility to know in a simple and fast way a lot of information about web attacks: class, type, remote ip, country, etc. Pfsense 2.3: open free Firewall. Fluentd 2.3: open source data collector. Elasticsearch 5.4: open and store engine. Kibana 5.4: Dashboard for creating powerful graphs for suricata alert visualization. Let’s start with Pfsense and Suricata installation and configuration. Pfsense is a open free Firewall based on FreeBSD SO. In addition to manage access rule, NAT, Load Balancing and other features like normal Firewall, it has the possibility to integrate with other modules like Intrusion Detection System (Suricata and Snort), Web Application Firewall (mod-security), Squid, etc. Suricata is the Intrusion Detection System module used for our scope: it is a high performance Network IDS easily installable in Pfsense by System Package Manager. In Pfsene Service/Suricata, after installing it, is showed the Intrusion detection system GUI. A HTTP Get with “/install/ws.exe” URI is detected as “ET TROJAN Likely Fake Antivirus Download ws.exe” of attack class “trojan-activity”. There is the possibility to also download snort rule because they are compatible. For doing that an oinkcode is necessary: read this https://www.snort.org/oinkcodes for understanding how to have an oinkcode. After inserting the source of rules, it’s possible download them by Update tab. Fluentd is a open source data collector that permits to parse the log file structuring in data type. For parsing the data is available a simple plugin called grok. The following url can be used for testing the regular expression made with grok: http://grokconstructor.appspot.com/do/match. 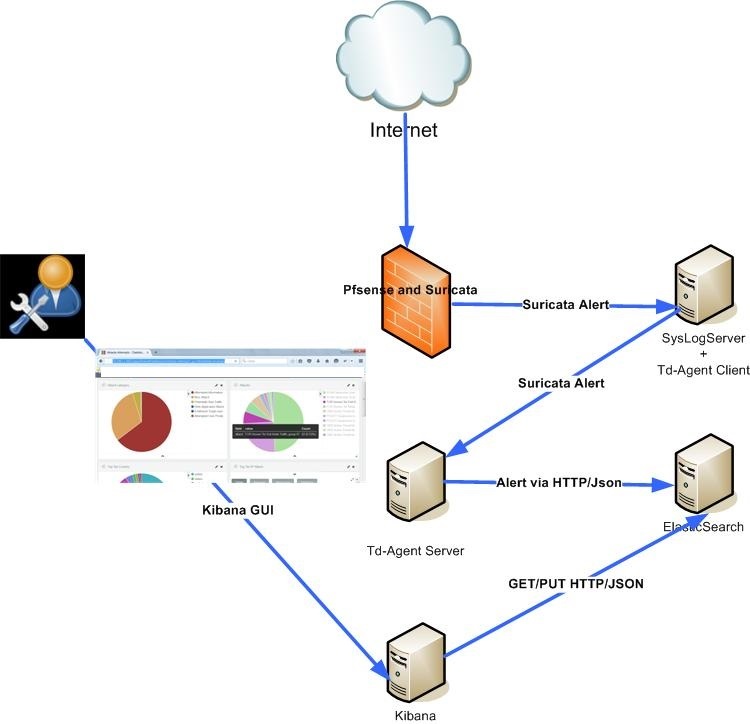 It’s simpler to understand how fluentd works showing the installation and configuration on td-agent client where are available the suricata logs. The package that I will install is td-agent: the stable distribution of Fluentd. Td-agent daemons is in listening in the suricata log and it parses the log received by the grok rule defined in the nginx_grok_pattern.txt file. Next the suricata log are sent to another td-agent server that stores it in elastic search database. Fluentd goes in tail in the suricata log file called /var/log/suricata.log. A alert is sent by suricata to syslog server and written in the log. A typical log is like the previous one: SCAN Sipvicious User-Agent Detected. Fluend after parsing the log following the grok rule forwards it to td-agent server with suricata_log tag. Perfect: the grok rule is correct and the alert suricata is parsed fine. Fluentd uses udp and tcp for comunicating with server: the server port 5141 must be opened on the Firewall. Now let’s to install and configure the fluentd server. The fluentd server installation procedure has already been explained for the client. New plugins are installed in order to add information about geographical location of IP addresses and for integrating the fluentd with elasticsearch. The GeoIp plugin uses the remote ip address as key to get from GeoIp database all the information needed: these new parameters are added to data received by td-agent client and sent to elasticsearch that is in listening on 192.168.2.1:9200 tcp port. Let’s go now to final step: Kibana and Elasticearch installation. Elasticsearch is an open engine that permit to store data in an index (you can think it like a database) and search by restful api. Restful api are a way to get and put data using http methods: Get, Post, Put and Delete. Every index is mapped to different types (you can think it like a table) and every type contains different parameters like the columns in a table. The objects present in the http methods are json formatted and every index is created in run time: no need to create index before putting data, as opposite to sql database. The elasticsearch installation is very simple: i suggest to follow this link https://www.elastic.co/guide/en/elasticsearch/reference/current/setup-repositories.html. After installing it, the elasticsearch can be started by systemctl start elasticsearch. As I said, no need to create any structure in the elasticsearch database. The td-agent server put the received records to elasticsearch by rest api. The index is created automatically by elasticsearch when the first record is received. Very cool. Elastichsearch changes the index every day: every index create has the time day appended in the end of the tag. In the our case, the tag is suricata_log, and it means that there will be index with suricata_log-YYYYMMDD. Kibana has created for every day a different index and it happens automatically: great thing. Before going to Kibana, a problem must be solved (this problem is not present anymore with kibana/elasticsearch 5.4, you can skip it). The string type by default is analyzed: it means that the every string is split in different words and the separator is the space. It is not good for us. Let’s go to Kibana now. Kibana is an open source data visualization platform that allows you to interact with data with powerful graphics. The installation is very simple: follow this link for that https://www.elastic.co/downloads/kibana. After installing kibana, starting with systemctl start kibana, you can login to dashboard http://ip_address:5601 and configure an index pattern: suricata_log-*. I don’t explain how to do graphs in kibana because is very intuitive: you learn more using it than reading my explanation. More power graphs can be created: the only limit is the fantasy. The graphs are very useful: they permit to monitor remote attacker and the attack class. The dashboard can start a incident process in case of seriuos attack or it can trigger an action like to block some ip, range or country in the Firewall. Creating another dashboard with the data log received directly from reverse proxy and/or application server. The suricata alerts can be filtered with these data for creating another better visualizations. Creating another dashboard with the data log received by Mod Security WAF configured in apache or nginx and adding it to suricata alerts. You configure shield roles for your kibana users to control what data those users can be read. This is useful to give access to dashboard to other teams like Help Desk. With these improvements the solution become a very good alternative to commercial IPS. Are you still interested to print it? What is the error that you have?